Jury members Chang Chen, Denis Villeneuve, Ava DuVernay, Lea Seydoux, Jury president Cate Blanchett, Jury members Kristen Stewart, Khadja Nin, Robert Guediguian and Andrey Zvyagintsev attend the screening of The Man Who Killed Don Quixote and the Closing Ceremony during the 71st annual Cannes Film Festival. 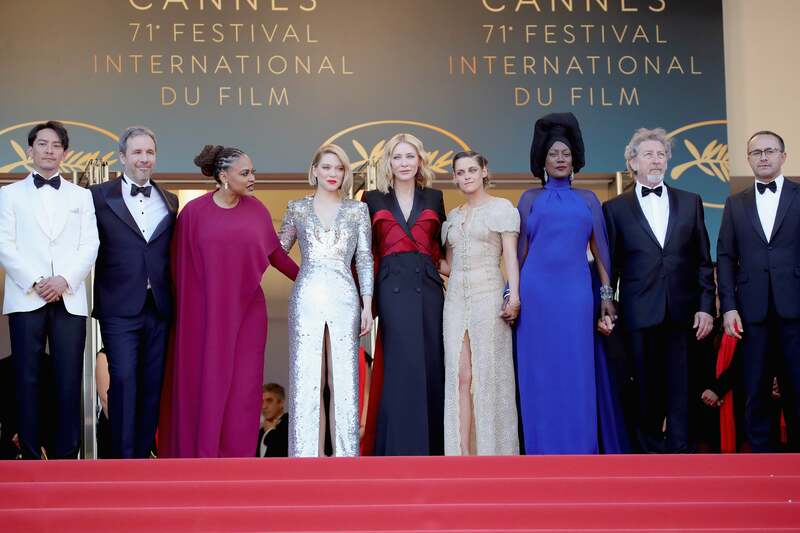 So the curtain finally came down on the 71st Cannes Film Festival with one last glamorous red carpet that had the full jury, led by Cate Blanchett, walk filmdom’s most famous staircase, followed by the cast of The Man Who Killed Don Quixote, the closing film which was screened after the ceremony. The Terry Gilliam movie is legendary for the production nightmares which plagued it and the decades-long legal wrangling in which it became entangled, resulting in a 30-year delay in its eventual completion and wrapping it in an aura of ultimate film maudit. So its screening here was also somewhat of a tribute to impossible film dreams everywhere, and beyond the glamour – enforced, if needed, by dress codes and selfie restrictions - the Cannes closing ceremony really also harkened to that theme: the emotion, empathy, aspirations, and humanity that cinema depicts and, at its best, elicits perhaps more than any other art. Terry Gilliam and the cast of The Man Who Killed Don Quixote arrive at the Palais. Inside the Palais, the jury rendered its verdicts which Blanchett assured had been at times hard-fought but ultimately collectively agreed upon (or as Madame la Presidente put it: “no blood was shed”). The Palme d’Or went to Japanese director and Cannes regular, Hirokazu Kore-Eda’s for his Shoplifters, a customarily restrained tale which was universally praised. But many of the surprises and highlights of the Palmares had happened earlier in the evening. (The previous night the Certain Regard sidebar jury presided by Benicio del Toro had tipped their hat to subdued Swedish supernatural thriller Gräns (Border) by Ali Abbassi, from the screenwriter of Nordic vampire fable Let The Right One In). The first award of the night went to Girl, the Belgian drama about a 16-year-old ballerina who is undergoing gender reassignment therapy, a first-time effort by Lukas Dhont, with a truly remarkable teenage lead in newcomer Victor Polster. Gender non-conforming stories are of course very much of the moment, although in the after-ceremony an American reporter did raise the question about assigning such a role to a cisgender actor. Dhont replied that the particulars of the role required an actor who could act as well as be convincingly proficient in ballet so that there was really only one choice for the role. “More importantly” he stated, “acting is above all the artistry of empathy and Victor has demonstrated it brilliantly”. The choice was widely applauded by the audience who had been abuzz about the breakout film for days. The screenwriting Palme was split ex-aequo between Italian director Alice Rohrwacher for her magical-neorealist Happy As Lazarus (Lazzaro Felice) and Jafar Panahi and Nader Saeivar, (Three Faces). Panahi has been banned from filmmaking by his country’s regime and was not allowed to attend the festival by Iran (the third time this has happened in his career). The Best Director frond went to Poland’s Pawel Pawlikowski for his Cold War, a 1950’s love story on the backdrop of that era’s political deep freeze. Before these prizes, the best actress prize to young Kazak Samal Yeslyamova for My Little One, the lower-depths story of a young Kyrgyz immigrant’s hardships in Moscow. 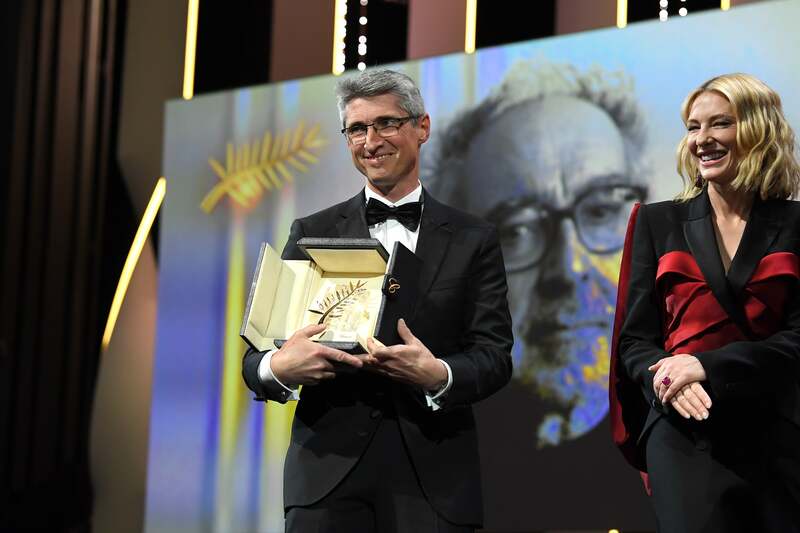 Cate Blanchett and Cinematographer Fabrice Aragno as he receives the Special Palme d'Or award on behalf of director Jean-Luc Godard for the film The Image Book (Le Livre D'Image). Another Italian, Marcello Fonte, took Best Actor honors for his role in Matteo Garrone’s Dogman, a harrowing tale of abuse and revenge in the Roman suburbs to which Fonte’s neorealist physical features lend an impressive dose of authenticity. Especially after Fonte told reporters about his childhood growing up in a landfill where his penniless family scavenged as he dreamt of acting in movies some day. The same kind of poignancy underlied the Special Jury Prize awarded Capharnaum by Lebanese director Nadine Labaki, the story set among poor street children one of whom eventually sues his own parents for having brought him into the world. The heart-wrenching story was made more tangible by the revelation that the film’s young, unschooled, non-professional star accompanied the director to Cannes and learned the first rudiments of writing in order to sign autographs for fans. In a surprise announcement, Blanchett said she had asked for special dispensation from festival organizers in order to award a highly unusual special prize to an innovator “who continually strives to push the boundaries of film.” By this time everyone knew that the prize was about to got to original New-Wave iconoclast Jean-Paul Godard. His poetic, political and passionate Image Book is a call to arms of sorts for cinema to strive to make a difference. It is as much a philosophical mix-tape or conceptual video art as it is a movie, but the rapturous applause that met the announcement signaled enthusiastic approval from both audience and critics. 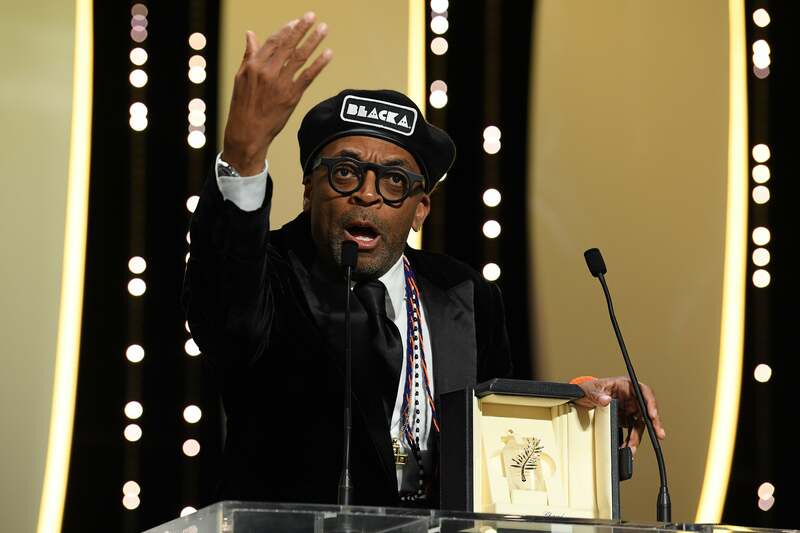 Grand Prix winner Spike Lee delivers his passionate acceptance speech. 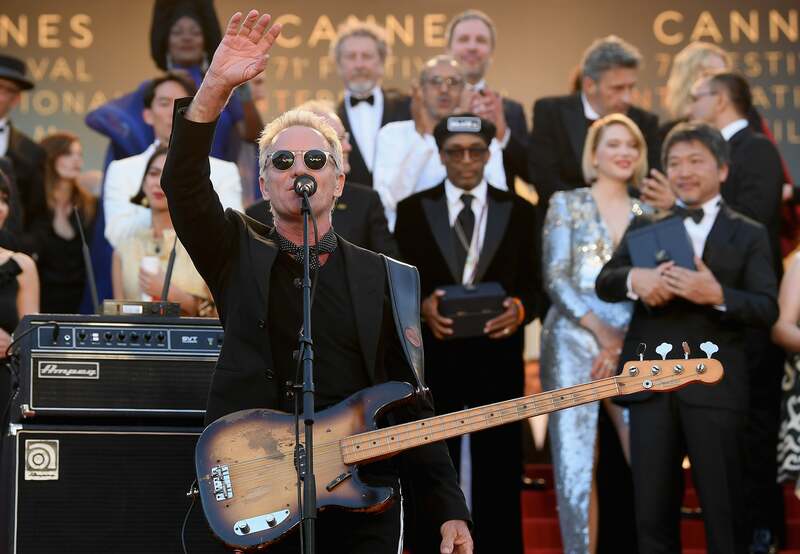 Sting closes the 71st Cannes International Film Festival. With that, the Jury and the winners repaired to the grand staircase where they were serenaded by Sting. A fitting “The End” for a festival which ultimately managed to bring out the best in movies.